When terrible things happen, it's human nature to want someone to blame. Even when that terrible thing is truly an accident, the confluence of any number of honest mistakes, no single one of which is truly the cause, but which together combine to make a tragedy. Perhaps if we weren't thinking so emotionally, we would realize that. But when the tragedy is as personal and devastating as the one that befalls Roman (Arnold Schwarzenegger) in AFTERMATH, losing his wife and daughter in a mid-air plane collision, that's easier said than done. Jake (Scoot McNairy) is an air traffic controller on duty when this tragedy takes place. During his shift, a combination of distractions, equipment not working, and the absence of a co-worker set the stage for disaster. Perhaps if Jake had done one or two things differently, the planes would not have crashed. Perhaps not. He certainly isn't deserving of all the blame for what happened. But as the human face of the tragedy, he makes an easy scapegoat. Jake blames himself, too. The weight of what has happened takes its toll, both personally and on his family. Jake's wife and son may be alive, but he is in danger of losing them to his guilt and depression. The film bounces back and forth between the stories of these two damaged men, as each of them tries and fails to put the tragedy behind them. Although Schwarzenegger proved capable of delivering a solid dramatic performance in 2015's MAGGIE, this role calls for a little more depth and range. He isn't bad here, but he's not exactly compelling, either. McNairy fares better, giving a believable depiction of survivor's guilt. 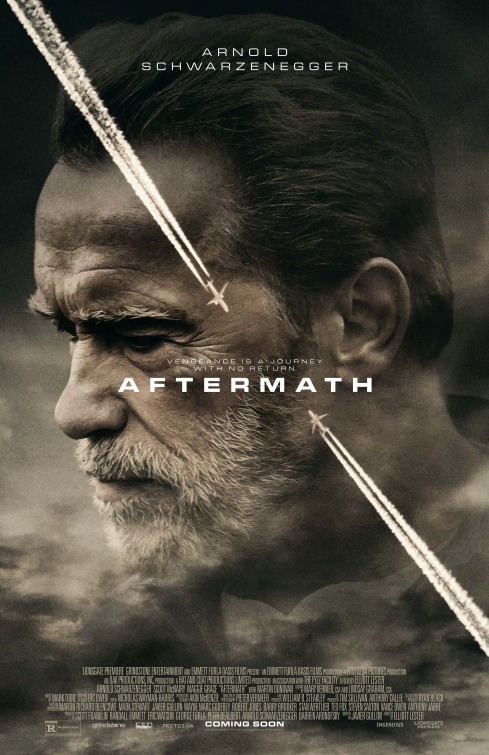 Based somewhat on a true story, AFTERMATH is a somber, serious drama directed in a professional but flat manner by Elliot Lester. I'd say that it builds to an inevitable confrontation between the two main characters, except it doesn't really build. It just kind of goes along in a slow, melancholy fashion for over an hour until a sudden shocking and dramatic outburst. After that, all that's left is what should be a powerful, emotional conclusion that lands without much impact. One can't say the movie is bad, but it's never as compelling as it should be given the subject matter. 2 out of 4 stars.